Robert: Left on the steps of a church as a baby, Robert was often hungry but never stole food like the other orphans in town. Introverted and extraordinarily intelligent, he knew all the Latin prayers and hymns by heart by the time he was five years old. Georgette: Her own mother died in childbirth, leaving Georgette with a father who, seventeen at the time, had neither experience nor aptitude as a nurturing parent, and a brother known in town as Le Fuer - The Spitfire - for his terrible temper. Perhaps to replace something missing from their own lives, both Robert and Georgette are drawn to the news of a crusader, twelve or thirteen, no older than themselves, travelling down through France with thousands of followers - all, unbelievably, children too. Of those thousands, this is the incredible story of two. This is a story of hardship, loss and love. I thought this was a fab little book which I really enjoyed. Crusade follows the story (albeit a bit loosely as it is hard to know exact details of the crusade as the official history on the topic is somewhat lacking) and focuses in particular on two characters who are part o the crusade: Georgette a peasant girl and Rober, an orphan who has been brought up within an Abbey. I enjoyed getting both a male and female perspective in this story and loved seeing how their stories finally link ...more I thought this was a fab little book which I really enjoyed. Crusade follows the story (albeit a bit loosely as it is hard to know exact details of the crusade as the official history on the topic is somewhat lacking) and focuses in particular on two characters who are part o the crusade: Georgette a peasant girl and Rober, an orphan who has been brought up within an Abbey. I enjoyed getting both a male and female perspective in this story and loved seeing how their stories finally linked up and interwined as the novel progressed. I thought both main characters were very sweet and I enjoyed finding out more about them. I was particularly interested to read this book as I am yet to have found another work of historical fiction what focuses on the children's crusade. 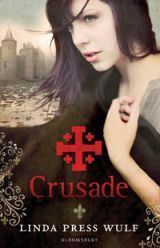 I have seen others that looks as crusades more generally but I think the children's crusade is particularly interesting and a topic that can really draw in young adults as they can relate to the people involved in the main story line. I teach High School history so this book is an utter god send for me. It is also good as it is quite broad in its focus covering not just ideas about crusades but also a variety of aspects of Medieval life including medicine, home life, towns and villages and the influence of the church more generally. One aspect the book does really well it that it explores the nature of religion and the diversity of faith and people' attitudes to other faith. The ideas but forward are still very much relevant to a modern audience and give the reader much to think about. I certainly see why it has been compared to the work of Crossley-Holland and Laird - there are certainly similarities in both the writing style and the content matter and I imagine if you've enjoyed work by either of these two authors you will enjoy Press Wulf's foray into medieval historical fiction. Thank you Bloomsbury for sending me this review copy. I want to read this. I love my historical fiction in like the middle ages and the crusades and such. A book I read about the Children's Crusade was Pilgrim by James Jackson which is an Adult Fiction novel. Thank you for this review, it sounds very interesting! Lovely review Kirsty! I wrote my review for Crusade yesterday and I agree with a lot of what you've said. I found the Medieval setting very interesting. What a great review - I fancied this anyway but I really will have to read it now!